Garlic or Allium sativum is a bulging plant member of the lily family. It is very closely related to chives, onions, eschalots, French shallot and scallions (various Allium species) garlic is part of the genus’s Allium, that is abundant in areas with mild conditions. Word garlic came from the old English word “garleac” which means “spear leek,” the word garlic is gained. It is referred to the long spear-shaped leaves of the herbs it may grow up to 60 cm in height. As a root crop garlic’s plants leave shoots in the air while the bulb grows underground. This bulb can contain a maximum of twenty cloves. As the garlic plant matures, the leaves turn brown pointing the right time for harvest. After harvest, the mud is removed, the bulbs then dried in the sun. After the garlic is dried properly, it is stored in a cool, dry place in hung position. The bulb in the ground is covered with skin or parchment-like paper and is usually off-white. Garlic is familiar with its magnificent aroma and pungent flavor. It is also known as the “stinking rose” due to the intense smell and the bulb shaped like a rose. Certainly, a single clove of garlic can increase the flavor of dishes. However, garlic has numerous uses, that is why it is one of the most preferred ingredients in the kitchen. Garlic is credited to be first used as foodstuff’s essence and herbs over 6,000 years ago in Central Asia. It is believed that in prehistoric Egypt, the Egyptians worship garlic in the tomb of Tutankhamun. Researchers have found six clay models of garlic. It is also believed that garlic played a crucial role in the establishment of the great pyramids of Egypt. The workers and slaves were given garlic to boost their strength and safeguard them from diseases throughout work. The ancient Romans and Greeks, also used garlic, which made them more courageous. It is believed that the voyagers from Portugal, Spain, and France introduced garlic to the New World. In the Middle Ages, during the plague in Europe, many ate garlic daily to battle against plague. Throughout World War I and World War II, garlic was used to prevent infection and gangrene for the injured soldiers due to the lack of penicillin. Various ancient civilizations believed that garlic can increase strength and energy. It is also seen that Greek and Roman soldiers used garlic before and during battle. Slaves from ancient Egypt were also given garlic to increase their strength during the creation of the famous pyramids. Researchers have found garlic clay models in the tomb of Tutankhamen. garlic was worshiped by the Egyptians long back. Folklore holds that the uses of garlic were different such as it was used to repel vampires and ward off evil spirits. The ancient Indians strongly believe that garlic is a booster who warms the body, cures different illnesses, and carries on life. In entire history, different uses of garlic have been well known. Such as to safeguard and healing themselves from deadly diseases. The Europeans ate garlic every day during the years of plague in Europe. Throughout the great world wars, soldiers used garlic for productively treating the injuries. As sufficient antibiotics were not available garlic was the best substitute. In 1958, the antiseptic properties of garlic were verified by Louis Pasteur. Raw garlic was verified to be a potent natural, antibiotic,anti-parasitic, antifungal and antiviral in a lot of studies. Nowadays, in Asia, garlic is one of the most leading bulb crops grown beside onion. Garlic is popularly used all over South Asia for food essence, food flavoring, pickles, and sauces. Garlic is cultivated in a huge amount in India and China. It has been reported that about 500,000 metric tonnes are harvested and produced in India alone. There are various causes for cardiovascular disease, which include raised low-density lipoprotein, increased LDL oxidation referred to as free-radical damage, raised serum total cholesterol, hypertension, and smoking. Routine consumption of garlic can lessen blood cholesterol and may raise HDL and LDL ratio. HDL refers to good cholesterol, and LDL refers to bad cholesterin. Many reports proved that taking garlic orally is connected with diastolic blood pressure and lowered systolic. Garlic can prevent a person against a possible strike and heart disease. Blood clotting is a general when bleeding is stopped or one has an injury, however, a blood clot is dangerous when it blocks a vein or artery to stop the blood flow, generally called the thrombus. Persons with a thrombus in a brain artery suffer from a stroke it is more fatal thrombus blocking an artery in the heart can result in a heart attack. To prevent blood clot, one can eat garlic eating garlic can increase nitric oxide in the blood vessels. Which helps to enlarge the blood vessels and aids in fibrinolysis or melting of blood clotting. Garlic can enhance a person’s immune system. It contains anti-cancer elements that can avoid colon cancer and stomach cancer. Persons with more garlic in their food intake or diet have got a lower risk of pancreatic cancer or colorectal cancer. Garlic additions can also decrease the progression of cancer cells in people with a family history of throat, prostate and breast cancer. It is also found that aged garlic decreases intestinal and heart damage common to chemotherapy patients. 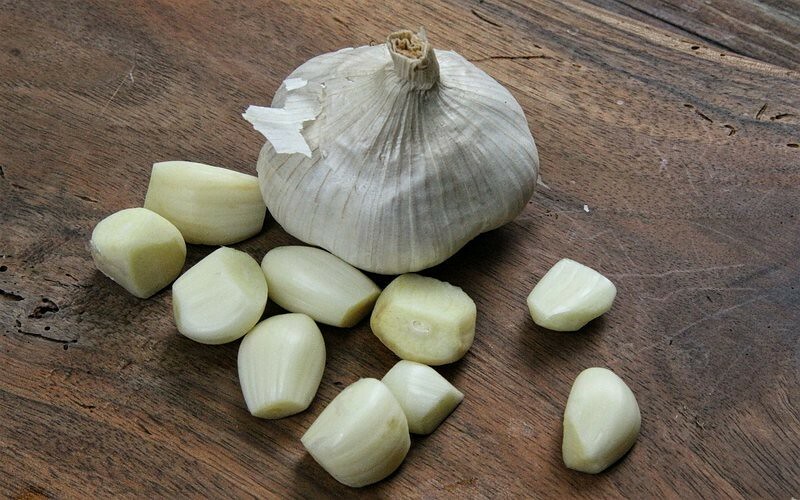 Pharmaceutical research suggests that huge amounts of fresh garlic, raw may have anti-parasitic properties against the ringworm, Ascaris, lumbricoides, and another common gastroenteric parasite. Which is the other additional health benefit of garlic? A study was made on a group of people they were given either garlic supplements or placebo for 12 weeks in the winter season it was found that garlic helped them in the prevention and healing of the common cold. People who received garlic had significantly fewer rates of colds than those who received placebo. When the same people were exposed to colds, the signs quickly vanished from that given garlic compared to those receiving placebos. Sulfur compounds such as allicin are found in garlic. It also has B6, vitamin C, magnesium, selenium, potassium, manganese and calcium and manganese, which help to fight many kinds of bacteria and viruses in test tubes. It was also found that the garlic ingredient ajoene in a cream productively resolves the problem on athlete’s foot, a fungus infection. Garlic has few disadvantages such as apart of garlic breath, there are other possible side effects, especially if used to excess. Raw garlic is very strong, so eating a lot could produce problems such as irritation or may even damage to the digestive tract. It is found those very few people that are allergic to garlic. Warnings of garlic allergy include skin rash, temperature, and pains in the head. Garlic could potentially disturb anti-coagulants, so it is advisable to be avoided before any surgery.